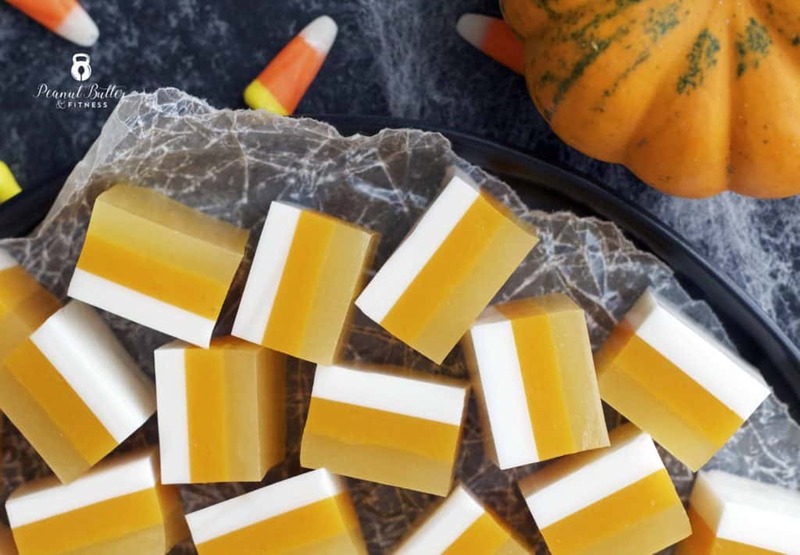 These candy corn themed jello shots will surprise your Halloween guests with all natural tropical flavors! They’re made with no artificial flavors or colors and even use good-for-you grass-fed beef gelatin. 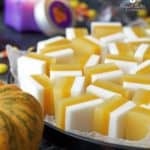 I love whipping these up for a party because they’re sooo easy to make for a crowd – no need to buy all those individual cups and then try to pour hot liquid jello into each individual cup. 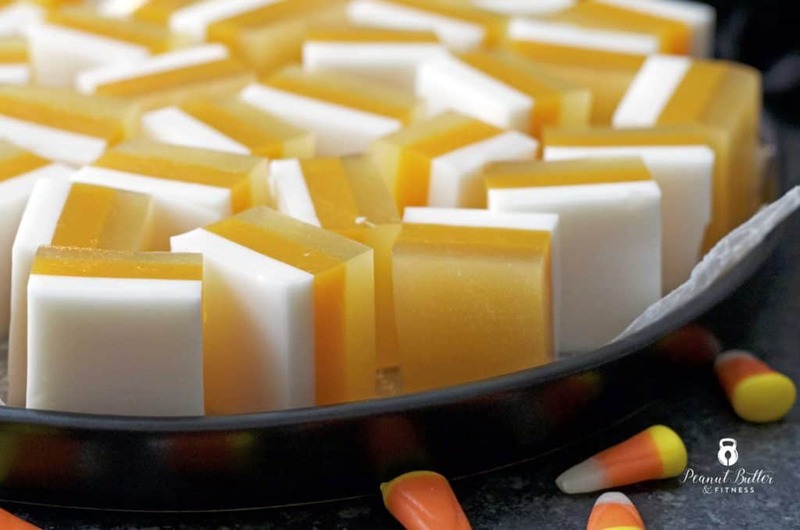 If you want a pretty jello shot with layers of flavor, you can’t beat the sheet pan method, in my opinion. Even though candy corn is fun to look at, it’s not the candy I would normally choose to eat. Is it just me or does it feel mostly like you’re eating wax? Either way, that certainly didn’t stop me from eating a handful yesterday during a long meeting. Oops. Grease a 9x13" baking sheet and line with plastic wrap to at least cover the bottom. You can skip the plastic wrap if your baking sheet is pristine (mine is not). Add coconut milk to a microwave-safe bowl and microwave for 1 to 1 1/2 minutes until hot. Add gelatin slowly, whisking the coconut milk while adding the gelatin. Allow to cool for a few minutes before adding rum. 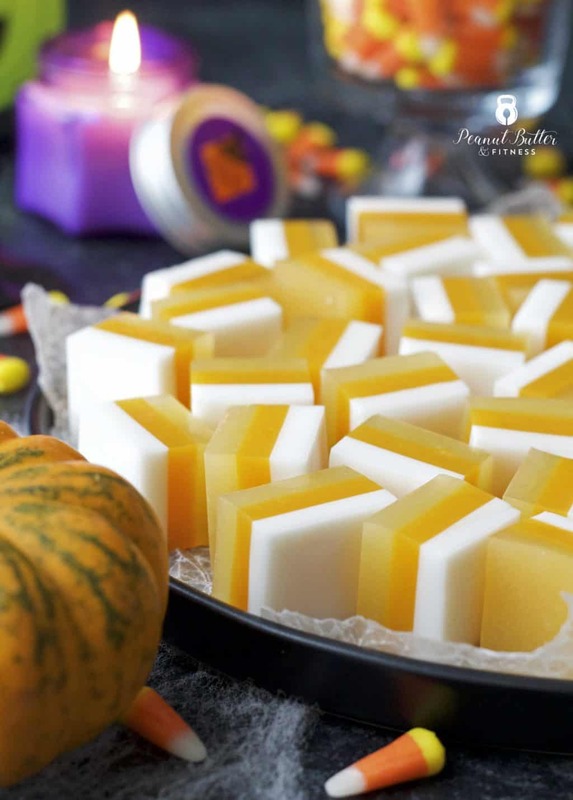 If you notice that the gelatin has clumped up a bit, pour the coconut milk mixture through a strainer into the lined baking sheet. Allow to set up in the refrigerator for at least 1 hour or until firm to the touch. Repeat process with orange and yellow layers, microwaving the juice and water instead of coconut milk. 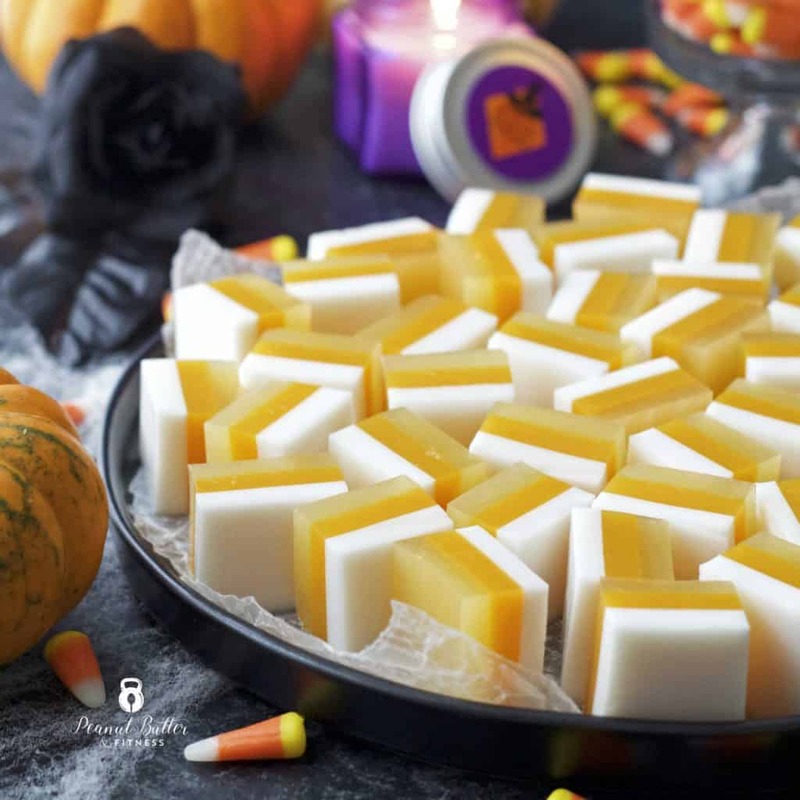 Allow all 3 layers to set up for at least 1 hour (or overnight) before slicing into bite size pieces. I cut mine into 9 x 6 rows for 54 pieces.